Yes, I know. Here it is only week 3 of the season and I’ve already fallen behind in the blog updates… Plenty of good info to share though as it has been a good couple of weeks here in camp, despite a pretty windy week 4. 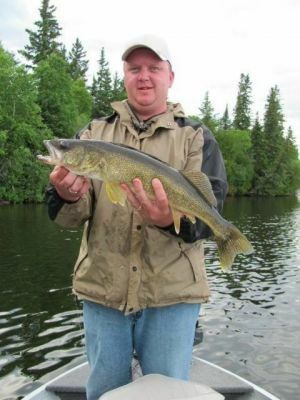 Despite some great walleye and pike fishing in Week 3, the highlight of the week may very well have been the MONSTER perch caught by the Bauters crew. 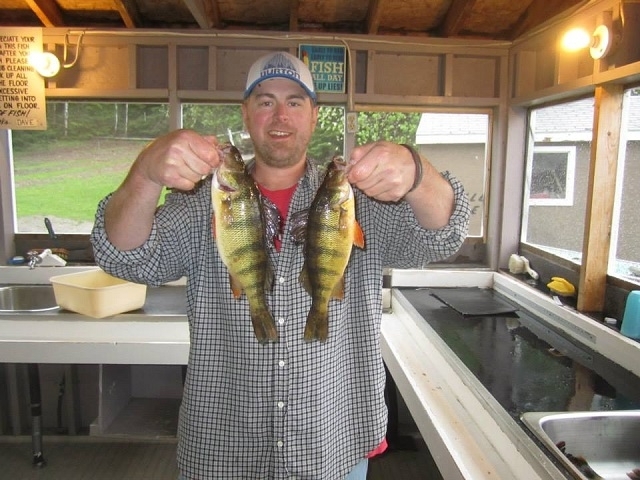 Tom and three of his sons, Brad and the twins, Robert and TJ managed just over 100 perch for the week. It wasn’t the great number of fish caught as they’ve caught more than that in years past, but rather the incredible size of the perch that was the story, with about 80% of their catch being >12 inches, and the girth of these perch being the biggest I have seen here in our 13 years. Marty Bonk’s had a crew of four with us in camp. While these guys don’t come every year, and one of the crew was a complete newbie this time around, man do they catch the fish. No depth finder needed here Marty says, he goes to a spot that looks good, starts fishing and catches fish. Sounds pretty simple, but I’ll keep my depth finder if you don’t mind! Another special guest in camp during week 3 was our friend Bernie TenPas from Texas. In addition to a good week of fishing and sharing the experience with his new friend Sharon and a couple of “the guys”, Bernie surprised us with a beautiful handmade bench as a gift upon returning to camp after a 6 year break. It is a gorgeous piece, and we were left totally speechless by his kindness, generosity and workmanship when he presented it to us. Incredible, and if you’d like to see it check out our FB page. Stan Schambach was here with his wife and two grandsons and had a great week as they transitioned themselves from a regular fall trip to a spring trip. Resisting the urge to “keep fishing deeper”, it didn’t take them long to figure out these spring walleyes really like the shallow water. Another late summer regular Gary Schwartzbauer brought his new bride Linda to camp this week also, and it didn’t take Linda long to make it known to everyone that “yeah, we will be back next year!” She had a ball fishing, and according to Gary, out-fished him most days. Dennis Schuh’s family was back in camp again this year, also after missing a few years. The had an incredible week of fishing with a lot of fish, some big one’s and an unforgettable trip to Lost Lake where they hadn’t gone in previous trips to camp. 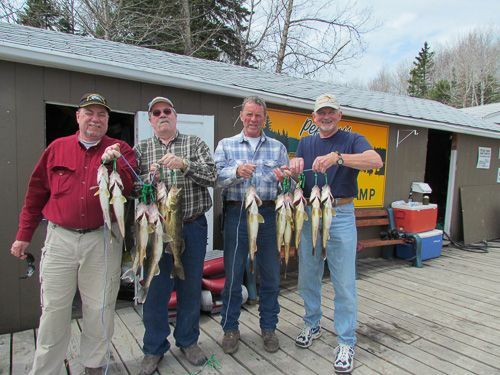 They came back to camp with a first hand understanding of the unbelievable fishery that is Lost Lake. Bob and Karen Stutzman from back home in northern Indiana were back in camp for the second or third time (my apologies for the bad memory) and caught a lot of walleye. Bob and Karen are members of the Michiana Walleye Association so they know a little bit about catching walleye and it showed as they had great numbers most days of the week and were very helpful in putting other guests on some good fishing spots and sharing some rigging information. Always nice to share info as there is plenty of water and fish for everyone. Tom Pritzlaff and Ken Gehl also returned to camp after missing about 6 years with their wives this time and had a great trip. Good to see them again after a few years. It took a couple of days to knock off the rust, but they finished the week strong with some good catches down the stretch and also a great trip back to Lost. For the first time all season, we had a WINDY week. During the first three weeks of the season we probably had about 3 windy days in total. In Week 4 it never stopped blowing, or so it seemed. I guess the law of averages caught up to us. Catching was down as a result, with the wind making it harder to get to some places on the lake and then making it harder to fish and control the boat if you did. Regardless there was still plenty of the “Catching fish, eating fish, taking fish home” results. Despite the wind making it more challenging, I would say a 100% rebook rate for the week would indicate that, despite the conditions, fishing overall remained pretty good. Lost Lake remained on fire with a couple of groups going back for the adventure and being rewarded with some outstanding catches. Week 5 is underway and the wind is down and the catches are up! Until next time, be sure to check out our Facebook page for some pics.